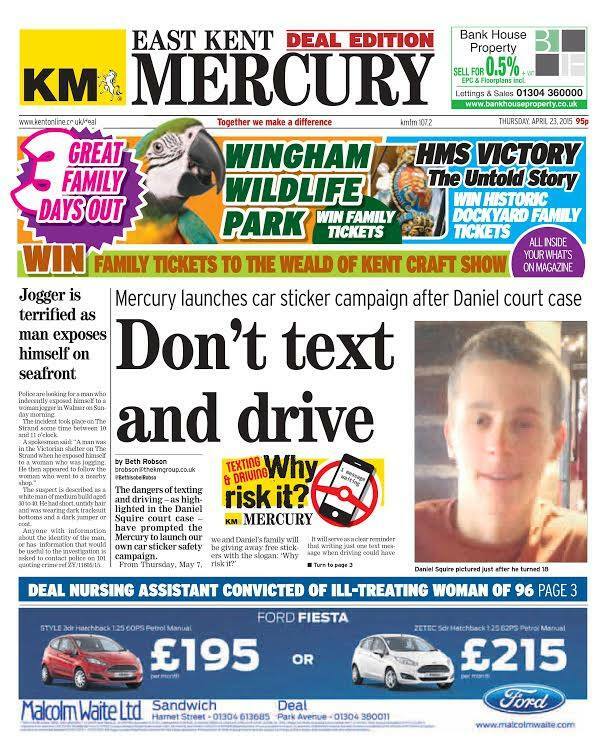 See more below about the death of young cyclist Daniel Squire which prompted this campaign. Display your sticker, from the Mercury office in Queen St, Deal. 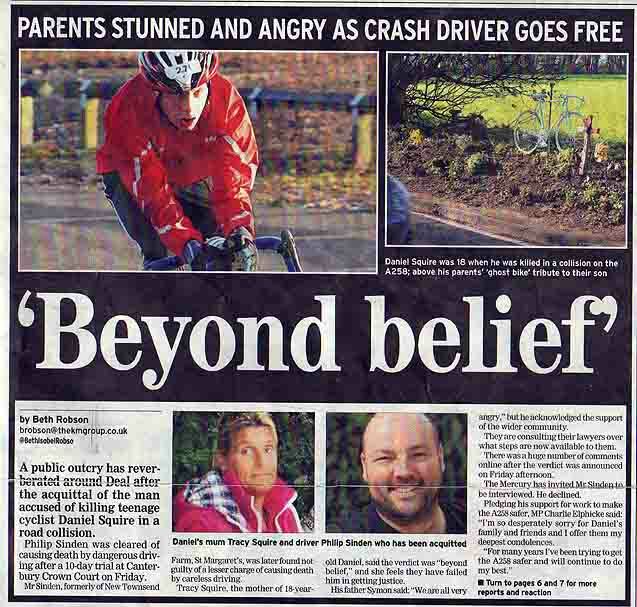 "A public outcry has reverberated around Deal after the acquittal of the man accused of killing teenage cyclist Daniel Squire in a road collision." The trial of a man accused of killing a teenage cyclist while texting in his van ended dramatically this afternoon in NOT GUILTY verdicts. The family of teenage cyclist Daniel Squire shouted at the jury : “Were you not listening?”, “What a waste of time” and “I can’t believe that” after the acquittal. Comment: "Something's not quite right here..."
Follow-up: "Something's seriously wrong here..."
Firstly, this is not a witch hunt. The objective here is to provide a case study for understanding whether there are issues with statutory legislation, the Crown Prosecution Service, or any other aspects of the legal process following a road collision. In the context of this specific trial, the question to aim for is: Given the defence case, how and why did the prosecution fail? And, if that can be answered, what can be learned from it? Secondly, this is all based on available information, but I was not a court attendee. I cannot stress this enough: all information within this article should be viewed with an appropriate level of caution. I have marked all information by source and listed the sources individually. Many supposed facts in here are corroborated by multiple sources, but the veracity of the information about the content of the trial in particular is not guaranteed. Click to read the full blog on 'Beyond the Kerb': "Something's seriously wrong here..."
Follow this Facebook page, "Justice for Daniel"
but 75% of them do it anyway. Two-thirds say they have read text messages at stoplights and more than one quarter have sent texts while driving. Texting and driving is against the law in UK as well as in many US states. The telephone survey of 1,004 U.S. adults was released in May 2014 by AT&T Inc. as part of an anti-texting-and-driving campaign. AT&T designed the survey with David Greenfield, founder of The Center for Internet and Technology Addiction and a professor at the University of Connecticut's School of Medicine. The survey was conducted among mobile phone users aged 16-65 who drive almost everyday and text at least once a day. Greenfield said the survey is the latest to show a discrepancy between people's attitudes and behaviours. Support the campaign - show the sticker! -- ﻿Twenty-eight percen﻿t said they are worried about missing out of something important if they don't check their phones right away. -- Just 6 percent answered that they are "addicted to texting," although 14 percent admitted that they are "anxious" if they don't respond to a text right away, and 17 percent feel "a sense of satisfaction" when they can read or respond to a text message.